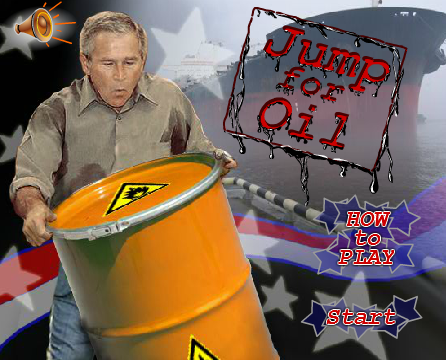 Here we have the George W Bush Jump for Oil video game. I want to lead off with this: make no mistake, we, and this game, are not political in the least. Love W or hate him, that’s your business, not ours, but this game is a riot! You may remember during the 2nd Gulf War that there was much hand-wringing, and pearl clutching that W was after the Iraqi Oil. Yet, our gas prices were higher than ever, so I think that rings false. However, the folks who made this game would probably disagree. Your goal as W is to hop from land mass to land mass to collect the goodies, oil, WMDs, whatever. Jump in the water and he will drown. 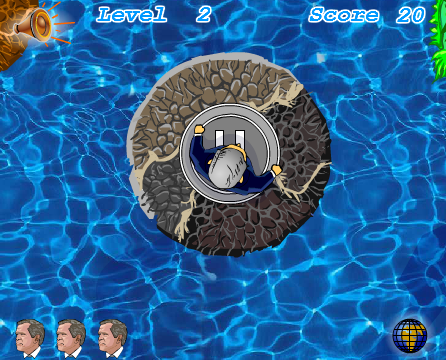 Use your mouse (flash game, only can be played on a computer, sorry!) to position W, and the left mouse button to make him jump. also, you will control how hard he jumps, which determines how far he jumps. At this point I have not yet seen any Obama or Trump games, but I’m sure they are out there, so stay tuned!